The rainbow has always fascinated mankind. It has been considered as a path, a bridge between two distant points on Earth, or between the Earth and another world. Depending on the cultures, this bridge is crossed by gods, shamans, wizards, or legendary heroes. In the Bible, the rainbow represents the alliance between God and men, between God and the Earth. It relates that the rainbow gained meaning as the sign of God's promise that terrestrial life would never again be destroyed by flood. In Greek mythology, the rainbow was considered to be a path made by the messenger Iris between Earth and Heaven. Indeed, the Spanish translation of rainbow is “Arco Iris”. In Asia, it evokes the illumination of Buddha, who comes back from the sky by this staircase of seven colors and in Islam, these seven colors represent the image of the divine qualities of the universe. It is nowadays the symbol of peace and renewal. 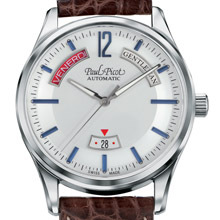 In this times of crisis, Paul Picot thus decided to present the new Gentleman Arc-en-ciel (“rainbow” in French), an exclusive time-keeper playing with the symbols of joy and gaiety, and indicating the silver lining in the cloud. Displayed at 10 o’clock in a wide arched opening, each day of the week corresponds to one of the seven rainbow colors. Thus, the dial shows every day another mood. Everyone can then give it its own symbolism. Placed in a high-grade steel case, this new timekeeper logically completes the Gentleman collection. The sobriety of this black or silver „velouté“ dial emphasizes the various elements of this timekeeper and makes it possible that each color of the rainbow be fully expressed. > Self-winding movement with display of the days of the week and the seven colors of the rainbow. Base 2834. 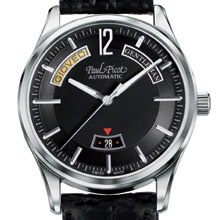 > Black or silver « velouté » dial. Second hand in the center, date at 6 o’clock, display of the day and the rainbow colors at 10 o’clock.